According to nonprofit organization First Book, the number of educators seeking books for children in need has increased 500 percent over the last four years. "The nonprofit social enterprise, which promotes educational equality by providing new books, school supplies and other essentials to schools and programs serving children in need, saw more than 60,000 educators and community program leaders register to access its offerings in 2015 alone. First Book currently serves more than 210,000 educators,” the organization said in a statement. The CEO and president of First book, Kyle Zimmer, blamed the rapid increase on more children in U.S. public schools coming from low-income families. 2015, she said, marks the first year the majority of children in public schools are from low-income families. "Educators across the country are facing enormous challenges, with vastly under-resourced schools and community programs, severe budget restrictions, and an ever-increasing number of needs for the children they serve. 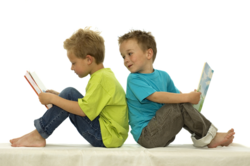 More children are coming to school with limited - if any - exposure to books and reading,” Zimmer said. In order to keep up with the growing demand, First Book has expanded its offerings. In addition to adding "new titles, digital learning tools, educational games, audio books, and downloadable guides matched with expertly curated book collections,” First Book has also began to provide access to "school supplies, healthy snacks and clothing – from winter coats to underwear,” Zimmer said. The American Federation of Teachers president, Randi Weingarten, described the powerful impact First Book has in classrooms. Most teachers spend hundreds of dollars or more out of their own pockets every year to augment books and school supplies for their classrooms because they know that without these resources, the children they serve can't gain the skills they need. First Book has proved to be an unprecedented ally for our teachers across the country, arming educators and programs serving kids in need with a steady supply of brand new, high quality books and educational resources – for the lowest cost anywhere or even free. Read more about First Book here.